Hear about the state's approach to economic development and strategies. Oklahoma City is a city on the rise, and we want you to stay informed about its major successes, challenges and ways that the business community can stay involved. 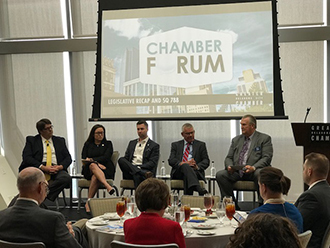 At the April Chamber Forum, attendees will gain insight into the state's approach to economic development and learn more about the strategies that will help Oklahoma strengthen its industries and attract new investment. Panelists will join Chamber President Roy Williams in a discussion about what will change about the state's approach to economic development, the industries on which the state will focus and the plan to succeed at both rural and urban economic development efforts. For more information or to purchase a half season ticket package, email register@okcchamber.com or call 405-297-8921.